Giraffes of London is a collection of photographic work, depicting the constant construction that London faces. It is based on urban photography and the concept of walking around the city, looking with a curious eye at the cranes which seem to always be present in the city, becoming transient citizens of London. But what are our relationships with these citizens? Giraffes of London is related to a visual representation of this urban growth and has a flow of transformation and interpretation. The photo­essay (with around 120 photographs in total, with different layouts) keeps an easy­to­read approach; it works within black and white photography (i.e. close­ups, wide shots, reflections, night­lights, etc) designed to create a dynamic and well balanced visual piece. The essay is shaped mainly with photographs but it also collects drawings (part of the ethnographic observation), field­diary notes, sketches and illustrated maps. Photographs, drawings and text are also composited to create a multi­layered representation of the city. It follows a sociological and artistic concept of construction with inputs of visual analysis and image composition, maintaining a dynamic visual narrative. 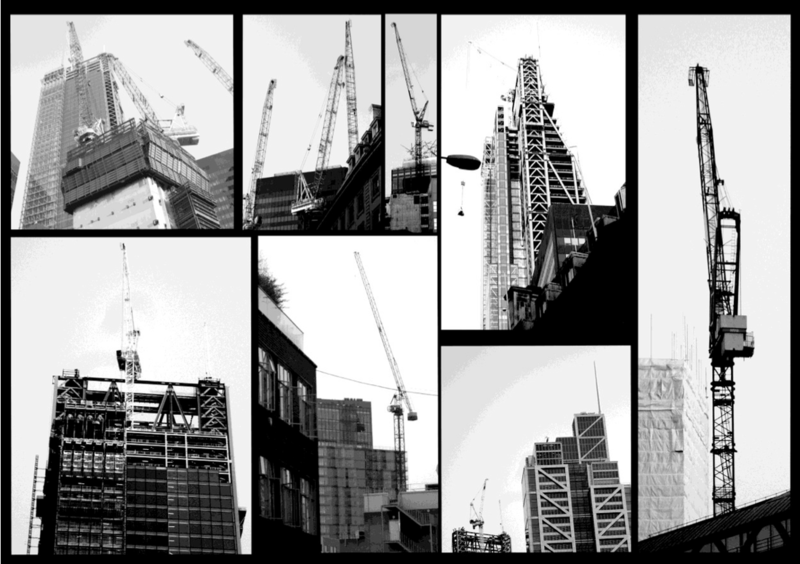 The project Giraffes of London calls a visual analysis of the social and empirical construction of London, also having comments and extracts from interviews taken in the streets. The project is not connected to Damiani's PhD work specifically, but it is developed with children and families as a main focus of his overall practice. Artist, Photographer and Visual Sociologist, Luca M Damiani works in the fields of Film-Animation, Arts, Human Rights and Visual Sociology. With a multi-methodological approach, he works with different creative techniques, and his main cross-disciplinary interest is in Childhood and the Visual. This is explored through various means such as character designs, visual narratives and photo-essays.